Calcium Silicate - Amity Insulation Group Inc.
Amity distributes Protherm calcium silicate block and pipe high temperature insulation. 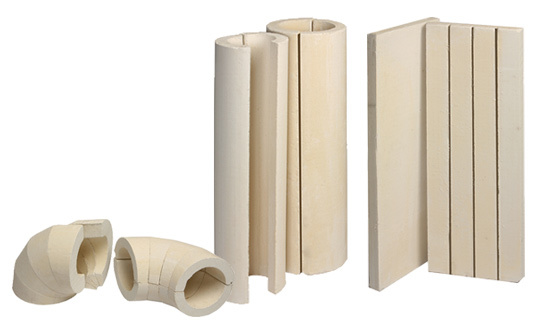 Our Protherm calcium silicate insulation is manufactured using an industry-preferred filter press method which achieves accurate dimensional tolerances, and superior compressive and flexural strength. Amity’s Protherm calcium silicate insulation is asbestos free, it meets or exceeds all of the requirements of ASTM C 533, Type I, and it has a natural corrosion inhibitor built in for long life. This material is ideally suited for industrial use in areas such as the petrochemical and power-generating industries, where mechanical insulation systems demand insulation capable of conserving energy, offering effective process control, and providing superior personal and fire protection. Amity is proud to offer its high temperature Protherm Soluble Fibre Blanket to customers. Protherm Soluble Fibre Blanket from Amity has superior thermal stability, thermal shock resistance, chemical stability, tensile strength, low thermal conductivity, and low heat storage.